Simon Says Stamp and Show Some Love! Hello Everyone ... Dan here, standing in for Linda while she whoops it up at CHA! Thank you for playing along with last week's challenge ... The winners will be announced on Wednesday .... so don't forget to check back ... this could be your lucky week! This week Simon Says Stamp and Show ... Some Love! 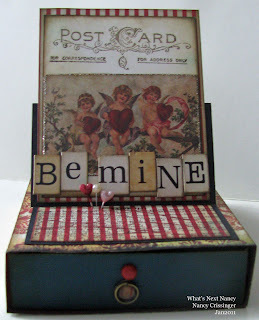 Lori chose to use this challenge theme as an excuse to make an easel card for Valentine's Day! She used paper from the Seasonal Paper Stack, a sticker from the Seasonal Salvage Stickers, paper from Core'dinations Whitewashed line embossed with the Cuttlebug Birds and Swirls embossing folder, and various embellishments to create this lovey piece! Of course Linda had to go vintage to show some LOVE and created this sweet triptych using Victorian era vintage images. 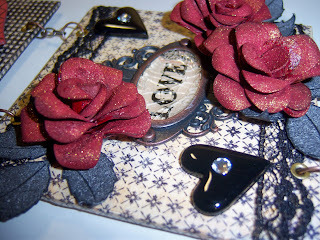 She accented them with Tim Holtz stamps from the Odds and Ends and Urban Grunge sets. The Grungeboard heart and wings were inked with Vintage Photo and Broken China Distress Inks and dry embossed with the Patchwork embossing folder. Terry made a Teabox, surrounded by lots of love....the heartshaped border is from Whiff of Joy, the teabox is worked on with distress inks, colors are Weathered Wood, Stormy Sky, Faded Jeans. On the front she placed the fabby butterfly from Wendy Vecchi and on top of the box she placed some white roses worked on with the distress rock candy, stickles and glossy accents from Tim Holtz and also the Distress inks. Dan made a playlist of various love songs and listened to them for inspiration while he made this! Among items he used were Tim Holtz stamp sets (Tiny Textures, Psychedelic Grunge and Mini Muse), Distress Ink pads (Walnut Stain, Fired Brick, Barn Door, Wild Honey, Rusty Hinge, Dried Marigold), Tissue Tape (Marketplace) and a Snow Cap white paint dabber. 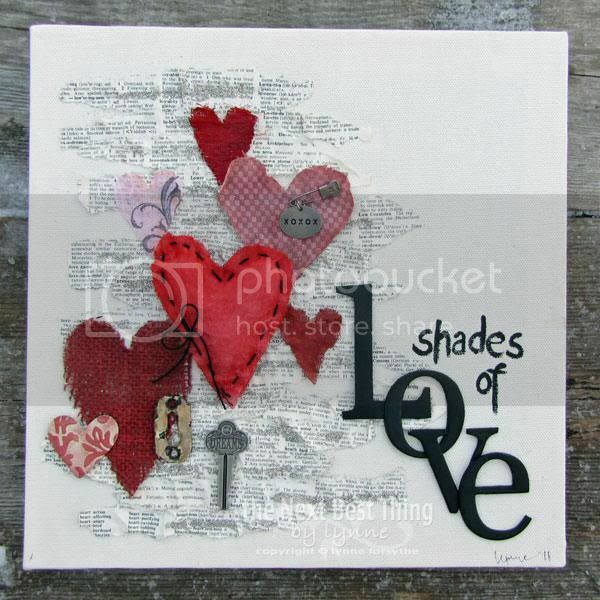 Linda used Grungepaper; Canvas; Ideaology chain; the meltpot and THE Wendy Vecchi stamps to create this piece. 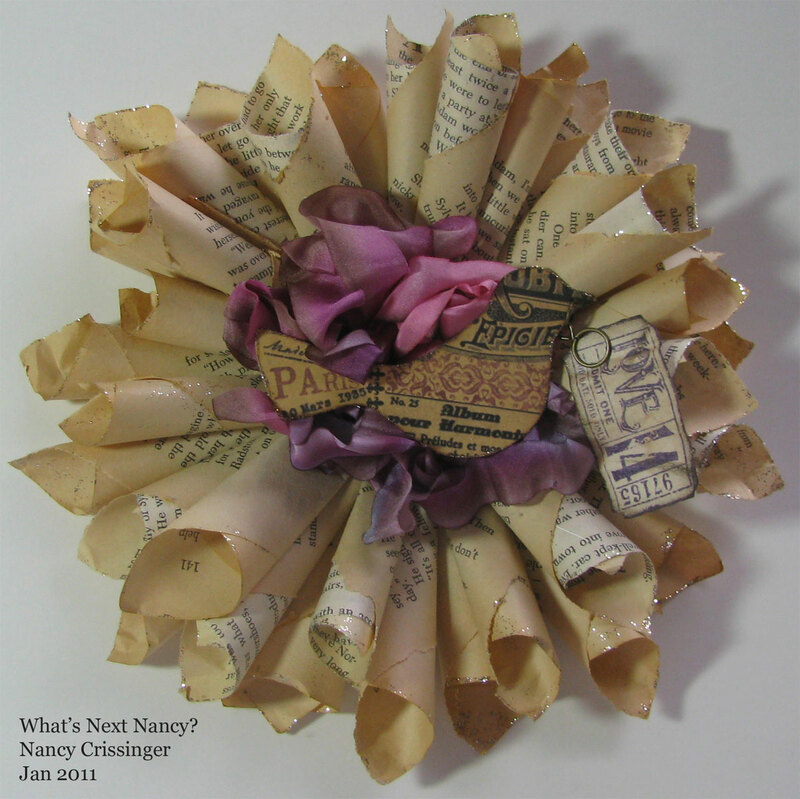 One of her high school romance novels became the base for Nancy’s paper wreath, the pages of which are now touched with Ranger Platinum Stickles. The centerpiece is a few pieces of Tammy Tutterow’s ribbons - the colors working perfectly with one of the birds in 7 Gypsies ATC Vintage Tags set. The tag, which is affixed with a Tim Holtz Memo Charm, can be changed with the seasons - today’s being Tim’s Love ticket from Love Struck. As soon as she saw this weeks challenge theme, Lynne knew exactly what she wanted to create....So she pulled out a 8 x 8 canvas, some dictionary pages, with words like love and heart and every shade of red she had, Victorian Velvet, Barn Door, Sun Sugar, Red Pepper, Fired Brick, and Aged Mahogany and Vintage Glitter Glass.......and oh the fun began. Everything was adhered to the canvas with Multi Medium. Nancy had so much fun decorating this paper mache heart shaped box. 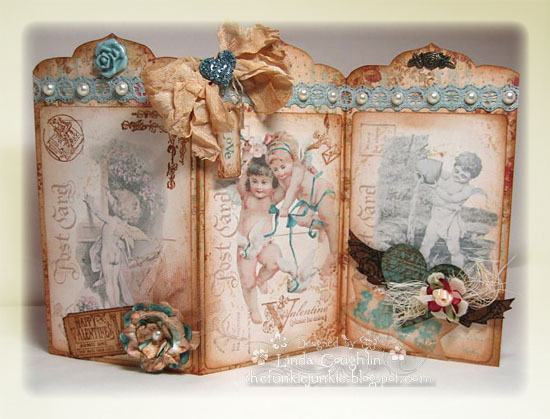 The chipboard wings were embossed with Tim Holtz Texture Fades and then tinted with Antique Linen Distress Ink. Lots of stickles were added to *bling* the heart. Visit Nancy's blog for more information on all the elements used to create this project. Made a card full of love, using Tim's Heart Wings die... The heart is cut from chipboard, painted with Claudine Hellmuth Gesso. When dry was inked, then covered with distress stickles and glitter, the wings from satin and the crown coloured with paint dabber. Tim Holtz Tattered Florals die was used to create the rose, the seam binding coloured using distress inks and the wonderful sentiment from Crafty Secrets Bird Notes. 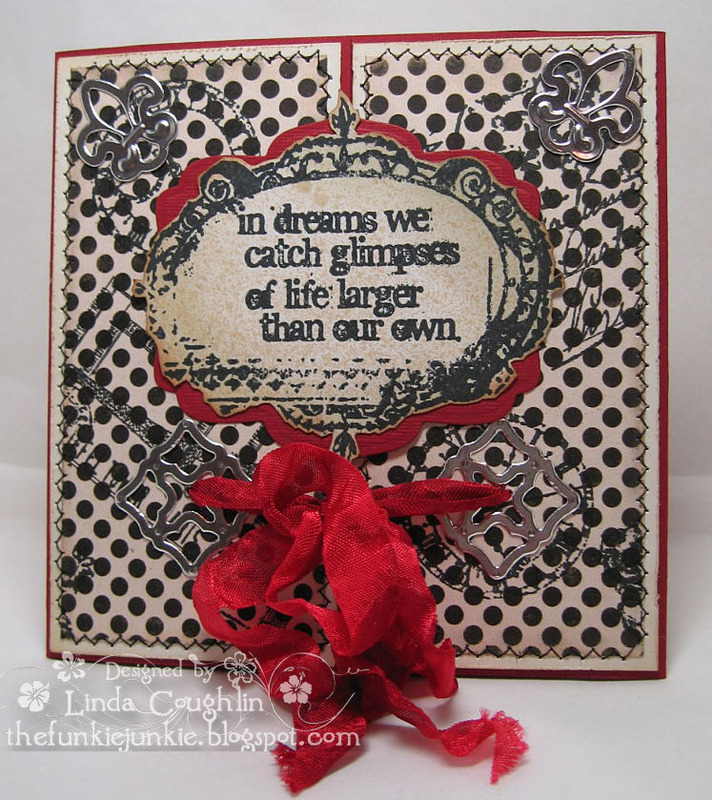 The papers are 7 gypsies and embossed with the bingo texture fade. Please do stop by the Design Team's individual blogs for more detailed pictures and further information on their work ... just click on their names. The Design Team are looking forward to seeing your interpretation of the theme! 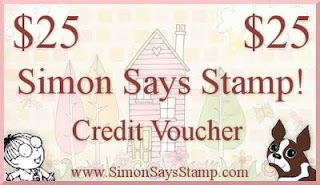 Fanfare required here ... Because our wonderful site sponsor Simon Says Stamp is giving away a $50 gift voucher! Oh yes people $50!! The prize will go to a random entry chosen by Random Generator. The challenge will close at Midnight Eastern time on Sunday 6th February 2011 and the winner will be announced during the following week. To qualify all you need to do is create a new piece of work ... post it on your blog ... with a link to this site and then pop a link below so everyone can come see what you made! And who knows ... if you don't win this prize ... your work may be selected for the much sought after Top Three Blinkie. Congratulations to each of you ... we LOVED your Dots! Please email Linda and she will send you the Top 3 Blinkie! You may have to wait a little while for a reply this week as Linda will be on a plane ... but please be patient and she we get back to you as soon as she can! We had lots of fabulous entries so Thank you to everyone that took part. Simon Says Stamp and Show a Childhood Memory! Hello Everyone ... Thank you for playing along with last week's challenge ... The winners will be announced on Wednesday .... so don't forget to check back ... this could be your lucky week! This week Simon Says Stamp and Show ... a Childhood Memory! One of Kim's childhood memories was making cupcakes with our mum and she remembers calling them fairy cakes. 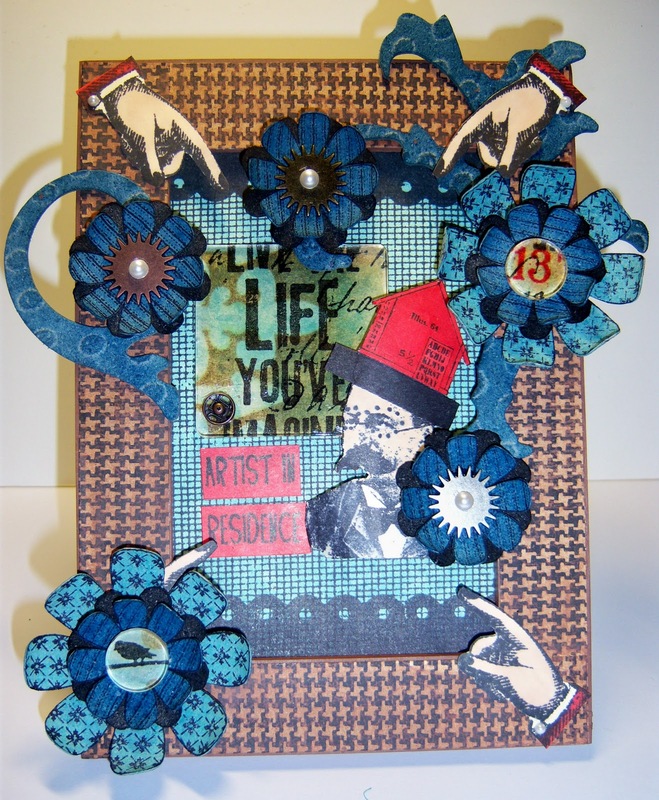 Kim used Wendy's art parts as the base, with steampunk papers... some beeswax collage using her melting pot. 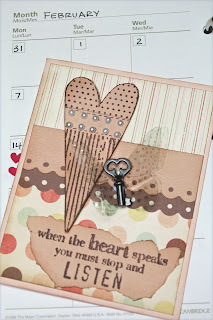 This piece includes Crafty secrets sweet stuff and a few Studio 490 stamps. 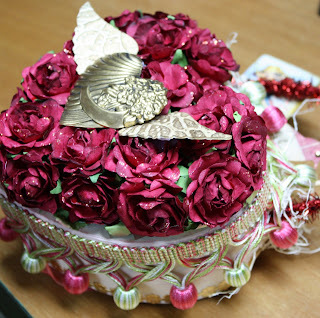 The rose created from Tim Holtz Tattered Florals die is coloured with Pine needles, the cup cake in Rusty Hinge and stickles, the edges are highlighted with gold paint dabber and an ideo-ology D-ring for hanging. One of Dan's earliest memories is of attending the New York World's Fair in 1965, not long after his family had emigrated to the USA. Among the products he used in this piece are 3 Tim Holtz stamp sets (Dance Card, Psychedelic Grunge and Rockstar) and Distress Ink pads in Weathered Wood, Fired Brick and Walnut Stain. It was November 1954 and Nancy was just a couple of weeks away from turning 5 when she was a flower girl in her Aunt and Uncle's wedding. This photo was reprinted on Claudine Hellmuth's Sticky Back Canvas, then Nancy tinted her cheeks using Tattered Rose Distress Ink and Cut-n-Dry pen nibs. Linda grew up on a farm in a small country town and wanted to recapture that childhood feeling with the wall hanging she created using stamps from Artistic Outpost's Home and Keeper stamp sets. The denim look of the letter backing was created with the Cuttlebug Paisley embossing folder with white craft ink sponged on the high parts. 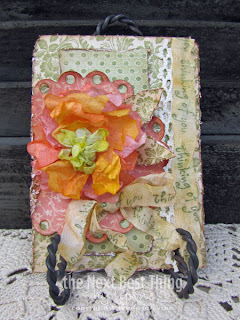 And, of course, the Tim Holtz Tattered Florals die was used to create the handmade paper/fabric flowers. One of Lori's fondest childhood memories is visiting her Gram and Gramps house, where Gram was always baking. She chose a 12 x 12 scrapbook layout to commemorate that, using the recipe page from the Seasonal Paper pack, the Fabulous Flourish stamp, the rosette die and some Thicker cloth letters. Nancy has wonderful memories of the Valentine card boxes she made in elementary school. Here she's made a folded easel box card, reminiscent of those. 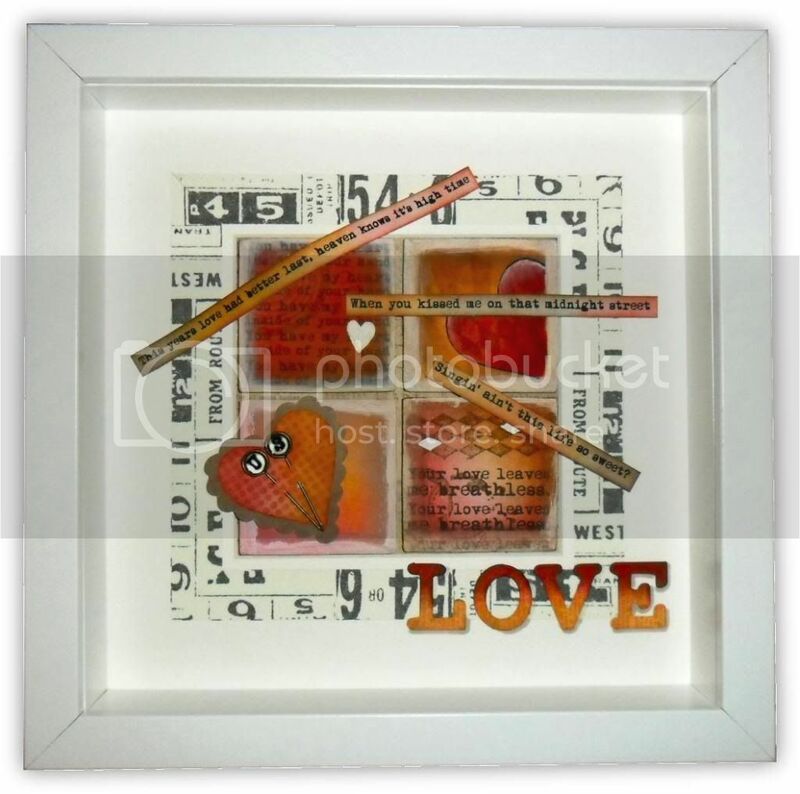 The drawer's made with Core'dinations paper, the drawer "pull" is a Tim Holtz Idea-ology Charm Clip, the "Be Mine" are letters from The Girls Paperie Chipboard Alphabet Eclectic Paper Letters Type .. all of the details can be found on Nancy's blog. Terry's childhood memory is listening to fairytales on a tape in her bedroom. She made a fairytale card, using the Tim Holtz Alterations Postcard and Sheet Music to emboss the card and the paperpad from Graphic 45, once upon a springtime .She used the papers on both inside and outside of her card. 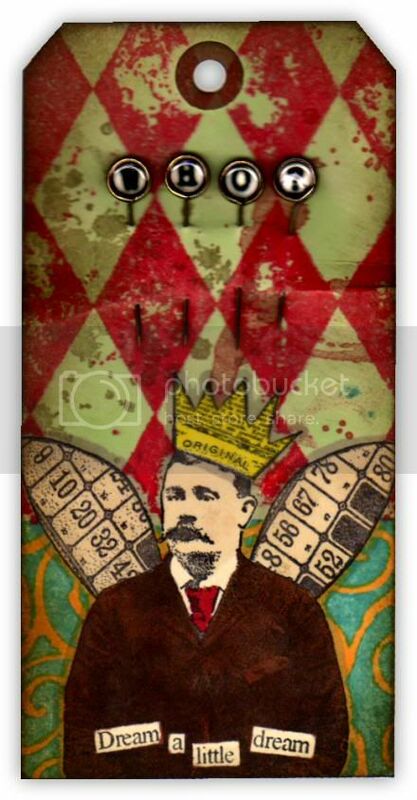 Everything was distressed with Vintage Photo, Victorian Velvet and Forest Green. She has also used the masking technique with distress inks. The roses have distress stickles, rock candy and glossy accents on top. 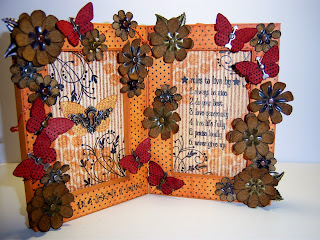 You need to pop over to Terry's blog ... the inside of this card is gorgeous too. I remember my friend's Grandmother's treasure box ... it was a beautifully decorated cigar box filled with Postcards, photos and letters from her sweetheart... I loved listening to her stories. 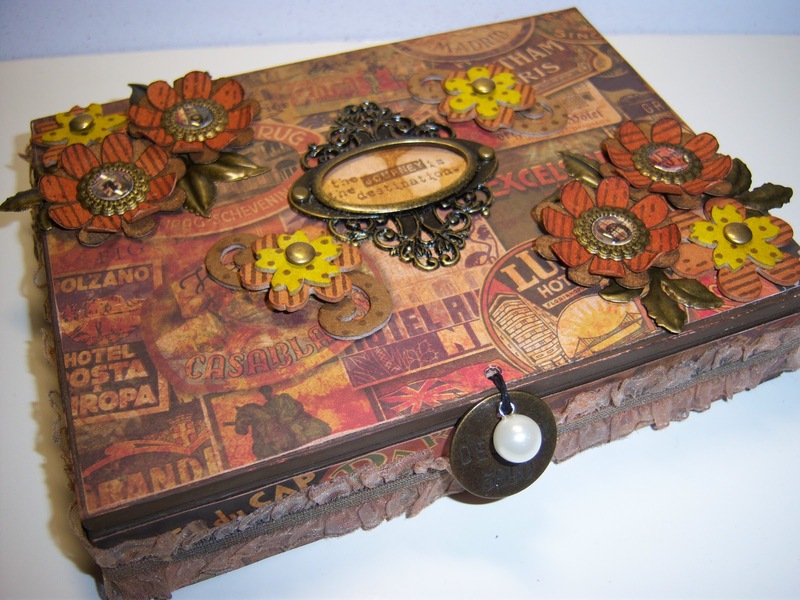 I have covered my cigar box with Tim Holtz Lost and Found Papers ... an Ornate plate and Wendy Vecchi Studio 490 stamps and some chipboard flowers. Now I just need to fill it up! The prize will go to a random entry chosen by Random Generator. The challenge will close at Midnight Eastern time on Sunday 30th January 2011 and the winner will be announced during the following week. To qualify all you need to do is create a new piece of work ... post it on your blog ... with a link to this site and then pop a link below so everyone can come see what you made! And who knows ... if you don't win this prize ... your work may be selected for the much sought after Top Three Blinkie. Congratulations to each of you ... we LOVED your masking! Please email Linda and she will send you the Top 3 Blinkie! We had lots of fabulous entries so Thank you to everyone that took part. Simon Says Stamp and Show Some Polka Dots! Hello Everyone ... Thank you for playing along last week ... The winners will be announced on Wednesday .... so don't forget to check back ... this week it could be you! For this challenge Simon Says Stamp and Show ... Some Polka Dots! Dan's mind is clearly moving towards breaking out of winter and looking forward to spring! Among the products he used are Distress Ink pads in Weathered Wood, Walnut Stain, Shabby Shutters and Wild Honey, an ink blending tool, Hero Arts Cling Dots stamp (on the clouds) and Studio 490 Seriously Art stamp set. 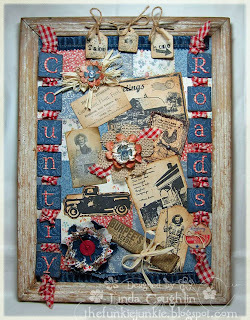 Lori chose to combine Jenni Bowlin mini papers and stamps from Studio 490 to make this little wall hanging. The flowers are from Live and Make Art, while the polka dot stamp that was used on the flowers is from All About Art. The dress is from Fashion Style and Art, stamped on paper from the same mini paper pack. A little bling from the Maya Road Chandelier piece, and we're ready to shop! Nancy used lots of goodness from Wendy Vecchi's Studio 490 for this week's challenge. The heart & sentiment are from Studio 490's Love to Make Art stamp set and the butterfly from Studio 490's Nature's Art stamped on Clearly for Art. Terry decided to make a card with polkadots, she got the dots from Graphic 45, once upon a springtime and embossed the card. She used Tim Holtz Alterations Bigz Dies Fancifull Flight and worked on the butterfly with Cracklepaint from Tim Holtz, a polkadot stamp and the roses are worked on with the Glossy Accents from Ranger and Distress Rock Candy. Distress inks that she used are Vintage Photo, Worn Lipstick, Peeled Paint and Tattered rose. The small butterfly on the postcard is Wendy Vecchi, Just Flutterby﻿. Nancy wanted to try her hand at a file folder book & Webster’s Pages’ WonderFALL papers caught her eye, both to cover the ‘pages’ & to make a Tim Holtz Rosette. 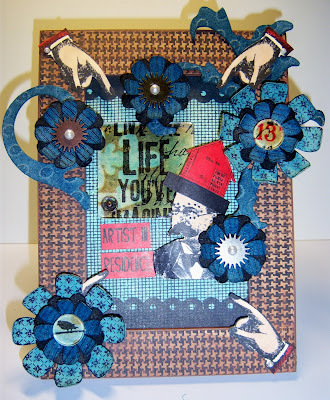 Lots of elements were added, including Jenni Bowlin’s Punctuation Tickets & a number of Tim Holtz’ Idea-ology parts. Wendy Vecchi’s Collectible Art stamps provided the perfect phrases on tags & tabs. It all began with "Once Upon a Springtime" for the polkadots!! Which then brought about visions of flowers in a field and off Lynne went creating yet ANOTHER flower. She used Eyelet Circles and Peony dies by Spellbinders and coffee filters. She colored her flower using Reinker Mixtures of Worn Lipstick, Mustard Seed, Spice Marmalade, Shabby Shutters, Scattered Straw, Spun Sugar...to name just a few!! And the ULTRA distress look was created using her Distress if All. Wanted to make a grunge bag but thought she would start with something a little smaller... She's used the Tag and bookplates die as the template. Began with the flower from Botanical art, stamped directly onto grungepaper and covered with glossy accents. The polka dots were stamped using ranger paint dabber, which resisted the distress inks. The back has had the same resist treatment but using the leaves from nature's art. The sentiment is also from nature's art stamped using archival black. 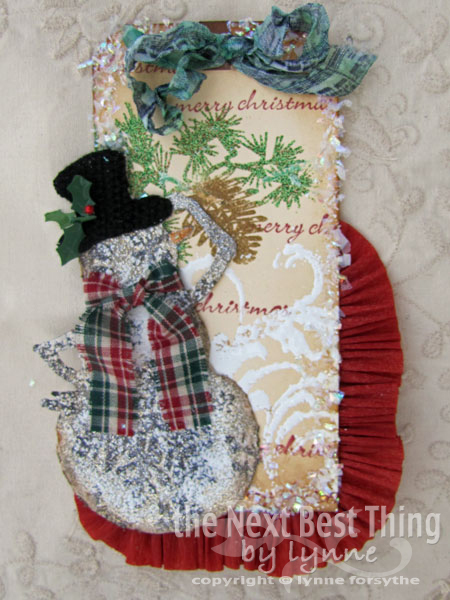 The strap is the polka dots ribbon from Websters pages holiday trims. This week Linda went dramatically different than her usual shabby chic style with bold black and white polka dots accented in a rich dark red. 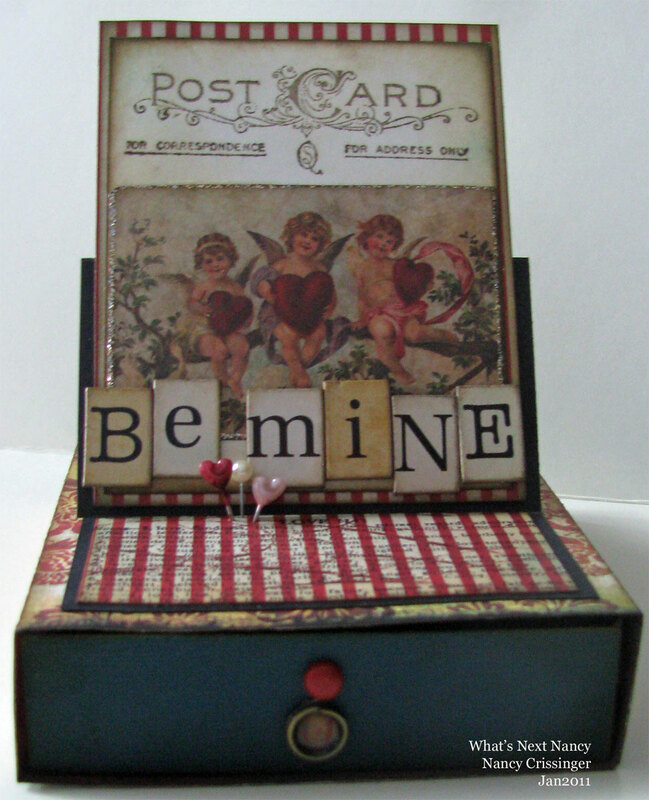 On her polka dotted front panel, she used stamps from the Tim Holtz Mini Classics set and for the sentiment inside, stamps from the Urban Grunge collection were used. Silver metal pieces accent the front panel, cut from Ten Seconds Studio Metal using the Spellbinders Fleur de Lis die. In my opinion ... NOBODY does Polka Dots like THE Wendy Vecchi! 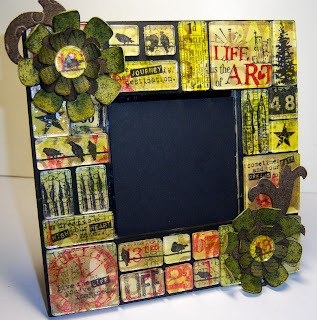 I used lots of Wendy's beautiful stamps to decorate my hinged frame. I must admit ... I got a bit carried away creating Grungepaper flowers and nearly covered all my Polka Dots up ... so I added a few dotty butterflies from Make Mine Mini Art ... just for good measure. All of the flower centres are Idea-ology Foliage... the butterfly bodies are Game Spinners and if you look really closely you may be able to spot some Ranger Black Enamel Accents too. The Design Team are looking forward to seeing your work! Drum Roll required here ... Our wonderful site sponsor Simon Says Stamp is giving away a $25 gift voucher! The prize will go to a random entry chosen by Random Generator. The challenge will close at Midnight Eastern time on Sunday 23rd January 2011 and the winner will be announced during the following week. To qualify all you need to do is create a new piece of work ... post it on your blog ... with a link to this site and then pop a link below so everyone can come see what you made! And who knows ... if you don't win this prize ... your work may be selected for the much sought after Top Three Blinkie. Congratulations to each of you ... we LOVED your entries! Please email Linda and she will send you the Top 3 Blinkie! We had lots of fabulous entries so Thank you to everyone that took part. Simon Says Stamp and Show Some Masking! Morning all ... Thank you for playing along with the last challenge ... The winners will be announced on Wednesday .... so don't forget to check back ... this could be your lucky week! This week Simon Says Stamp and Show ... Some masking! Dan created his own mask for the main figure by stamping on a post-it-note and then cutting out the image, which he then placed on the tag while he stamped his backgrounds. 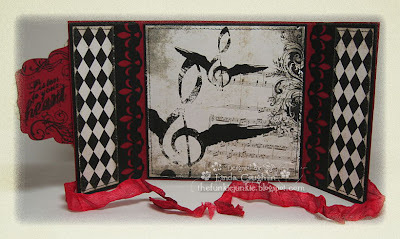 He used 3 of Tim Holtz's stamp sets, Winged Things II, Creative Textures and Spills and Splatters. Other products used included Broken China, Walnut Stain and Barn Door distress inks, glossy accents, memo pins and a Memento Tuxedo Black Ink pad. 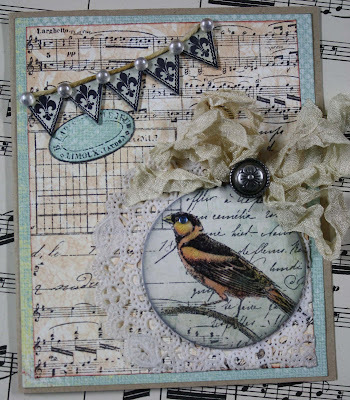 For this week's challenge Nancy used one of her favorite Tim Holtz masks titled Concerto. You can check her blog to see how this project started. 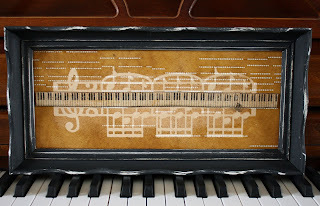 Nancy used an old frame, vintage player piano sheet music, Adirondack Butterscotch color wash, Tattered Angels Wheatfield as well as mixed her own *formula* with Vintage Photo Distress Reinker, Heirloom Gold Perfect Pearls shaken in a mini-mister. 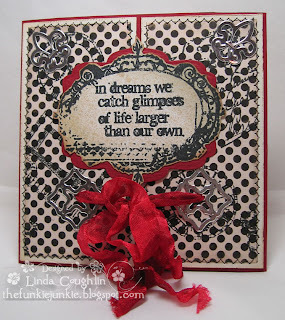 Lynne chose to do a layout for this weeks challenge....something very different but very "ARTSY". 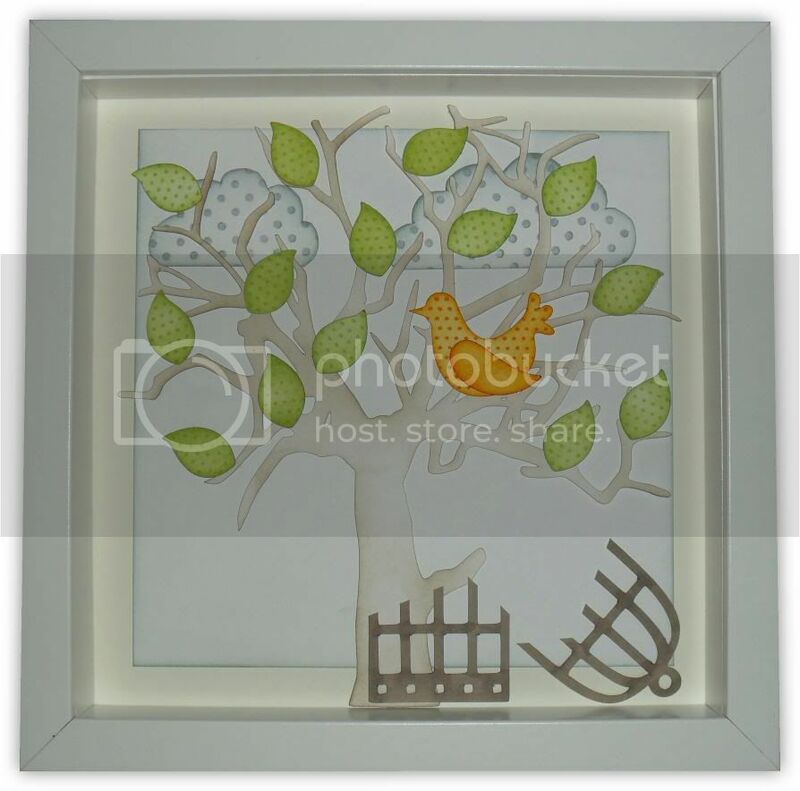 The design was based upon the colours of the photos of her son....Black Soot, Barn Door and Pine Forest. She misted the Hounds Tooth Prima mask with a Black Soot "REINKER MIXTURE" (mini mister, reinker ink of choice, perfect pearls of choice and water). 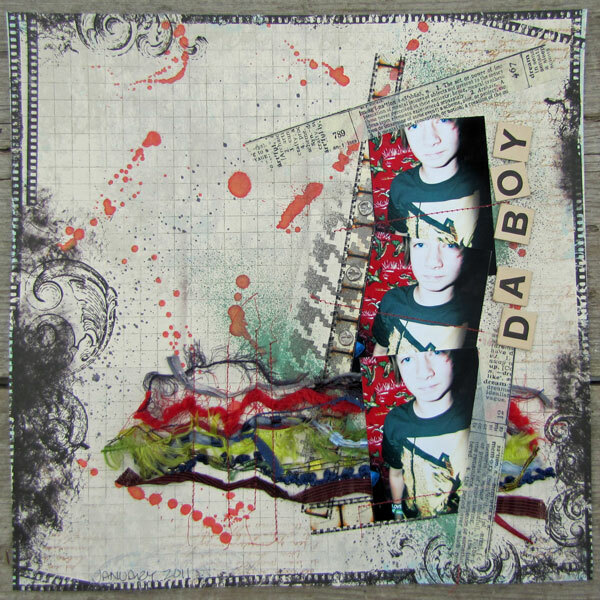 For accents around the photo montage she used a piece of Film Strip stapled to the page with her Mini Attacher and then accented with brads altered with the Texture Hammer. To finish off the page she added strips of Tissue Tape. Nancy’s ready to create with spring’s colours, so she chose the Valentine cherub from Tim Holtz’s Seasonal Mask holiday stencil to pair with papers from My Mind’s Eye’s “Lost & Found” line. The cherub’s coloured with Ranger’s Spun Sugar Distress Ink, then everything’s dazzled with Ranger Platinum Stickles. Lori wanted to demonstrate the versatility of Studio 490 stamps and also wanted to try the masking technique with the Adirondack paint dabbers, so she came up with this whimsical painting on a canvas panel. She stamped the butterflies from the Nature's Art, Botanical Art and Make Mine Mini Art sets onto a tag cut from mask sheets using the tag and bookplate die, then carefully cut out the butterflies and used the negative mask to fill in the butterflies with paint dabbers in Red Pepper, Sunset Orange and Purple Twilight. For more information on Lori's beautiful flowers ... check out her blog. Terry used the Masking technique on the butterflies. 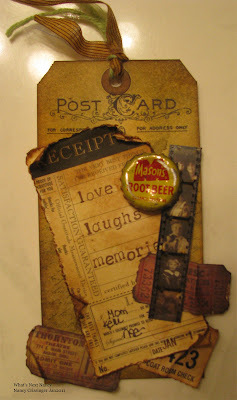 The colors for the Spring Tag are Dried Marigold, Peeled Paint, Vintage Photo and Rusty Hinge. ﻿The butterflies are from The Wendy Vecchi Just Fly and were stamped on the tag itself and on the fabulous coloured paperpack from Graphic 45, Romantique. The background stamp is from The Tim Holtz, Fairy Garden. Linda created a large refrigerator magnet calendar for her project and included two different maskings. First, she created her own mask using the Spellbinders Fleur de Lis die and low tack painter's tape. She used that mask to create a design around the circumference of her project and applied Snow Cap Adirondack Paint Dabber. 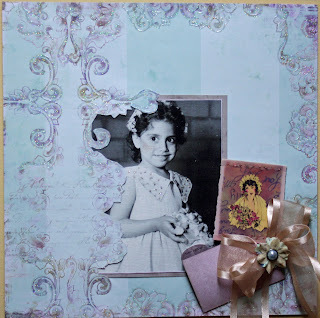 The other masking was done on the tag with a Tim Holtz Floret Mini Mask and sprayed with a mixture of Vintage Photo Distress Ink, Heirloom Gold Perfect Pearls and water with a Mini Mister. Kim uses a few masking techniques on her card. The card base, was first sprayed with glimmer mist to give a subtle colour and then she used Tim Holtz Floret Mini Mask for the corners.The main image is cut from nestabilities labels 8, inked with distress inks and Wendy's text stamp. Kim wanted to try something new (for her), she poured some masking fluid onto her non stick sheet and pressed the botany image from fairytale frenzy and stamped over the text piece. When dry she went in with distress inks to really bring out the contrast against the mask. I masked a nice big piece of Ranger Manilla 12 X 12 cardstock using Tim's Borderline mask ... I then used lots of Tim Holtz's stamps to create a background for the Idea-ology fragments. 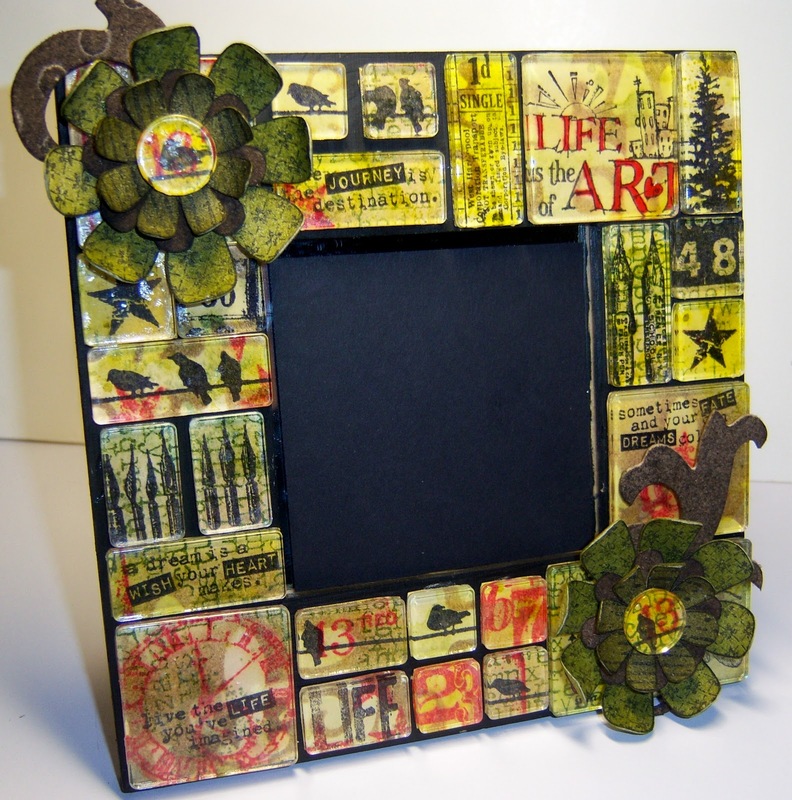 I finished the mirror off by adding a few Grungepaper flowers using Wendy Vecchi's Studio 490 Live and Make Art. The prize will go to a random entry chosen by Random Generator. The challenge will close at Midnight Eastern time on Sunday 16th January 2011 and the winner will be announced during the following week. To qualify all you need to do is create a new piece of work ... post it on your blog ... with a link to this site and then pop a link below so everyone can come see what you made! And who knows ... if you don't win this prize ... your work may be selected for the much sought after Top Three Blinkie. Congratulations to each of you ... your work was gorgeous! Please email Linda and she will in turn send you the Top 3 Blinkie! We had lots of fabulous entries so Thank you to everyone that took part. Simon Says Stamp and Show your Newest Stamp! 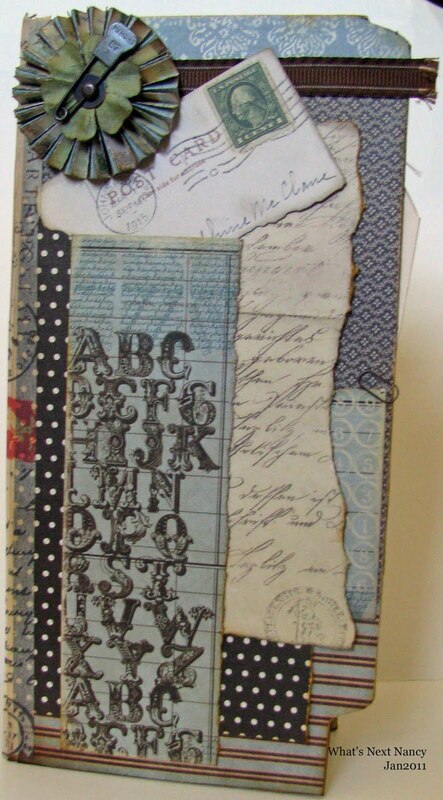 One of the newest stamp sets in Nancy’s stash is Tim Holtz’s “Postcards” & it’s one of her very favorites! The tag was colored with Forest Moss, Wild Honey & Vintage Photo Distress Inks, then the 7Gypsies ATC tag was embellished with tickets from Tim’s Lost & Found paper pad, faces from the same paper pad placed under Film Strip Ribbon and a vintage pop bottle cap. 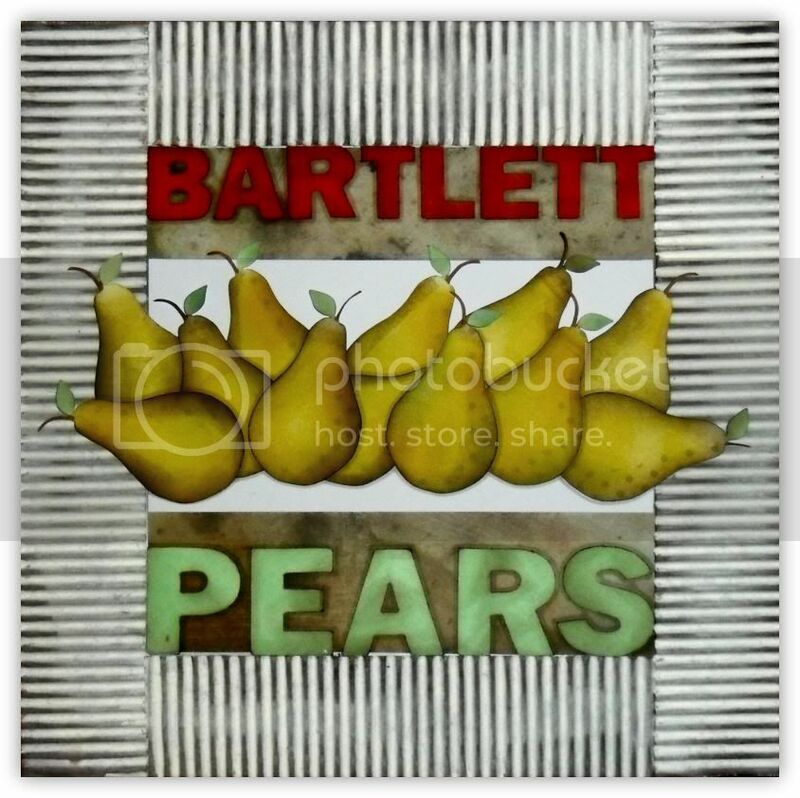 Dan's newest stamp is a polka dot cling stamp from Hero Arts, which he's used to great effect to add textural interest to the edges of these pear cutouts. Other products used include Distress Ink pads in Shabby Shutters, Walnut Stain and Mustard seed, a white paint dabber and Tim Holtz's Lost and Found paper stack. Nancy was so excited about receiving this new Hero Arts stamp from Simon Says Stamp Superstore that she couldn't wait to make a card with it. You can find the stamp in the new Hero Arts 2011 Catalogue and it's called Musical Collage. This stamp is so beautiful it didn't need many additions to make it sparkle. Nancy added ribbon with a button topper, a small banner with pearl drops and gave the little bird some color with Copic Markers. Terry decided to make a Large wine label, she really had fun with her newest stamps, she could not decide which one to use so she used both of them. The first one is The Wendy Vecchi Rubber Stamp Just Fly, she stamped the image and cut it out, then worked on it with Distress inks, Peeled Paint, Barn Door and Vintage Photo. She made it 3D by cutting the stamp again and on top of it she placed Glossy Accents from Ranger. The second stamp is The Tim Holtz Fairy Garden, it was stamped on the wine label and worked on with the Distress inks and Glimmermist from Tattered Angels. Of course she could not work with the Distress inks without using her blending tool. The borders of the Wine Label are created with the EK Success Edger Punch. 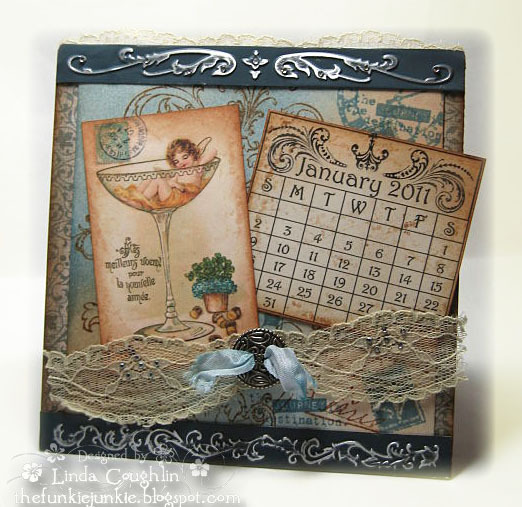 Linda decided to kick off the new year by making a calendar with her newest Tim stamps. She has wanted the Fabulous Flourishes set forever and was thrilled to finally own it! She created the calendar frame out of cardboard and covered it with designer paper. At the top and the bottom are strips of 10 Seconds Studio metal that she embossed with her Cuttlebug and sanded. The January calendar sheet is slid in from the side and can be removed and replaced with the subsequent months as the year goes by. 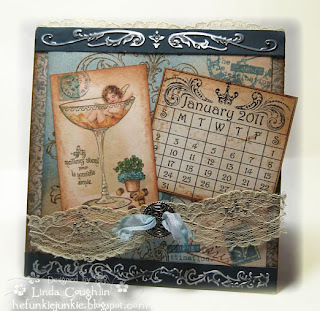 Her other new stamp set, Tim Holtz's Mini Classics, was also used to stamp the background of the January sheet. The sheet was also sponged with Stormy Sky and Vintage Photo distress inks. Check out Linda's blog for full details about her 2011 calendar. Lori doesn't keep track of which stamp is her newest, but she's sure that a couple of Studio 490 stamps would be included in that group! The newest stamps she used were from the Be Happy...Make Art, and Fashion Style and Art sets. Vines made with grungeboard and the Regal Crest die, and a bright background made using Cranberry and Butterscotch Colorwash complete this cheerful tag to help with the winter doldrums! Lynne knows her tag has a bit of Christmas flare to it but her theme is Winter. One of her FAVORITE new stamps is from Tim's Sketchbook stamp set....the pine bough. In keeping with the winter theme she used another of her favorite NEW stamps, the Fabulous Flourish by Hero Arts, which she embossed using White UTEE. The Snowman was cut using Winter Wonder and embossed with the Snow Flurries Texture Fade. The edge of the tag was accented using Faux Snow. Kim's newest stamp is a couple of crafty secrets sets, although they're an older set she has only had them a few days.. so she set to work and decided to make a vintage hanging using sweet stuff. She started with some of Wendy's magnificent art parts, covered them with cosmo cricket's circa 1934 patterned papers and inked edges with distress inks. 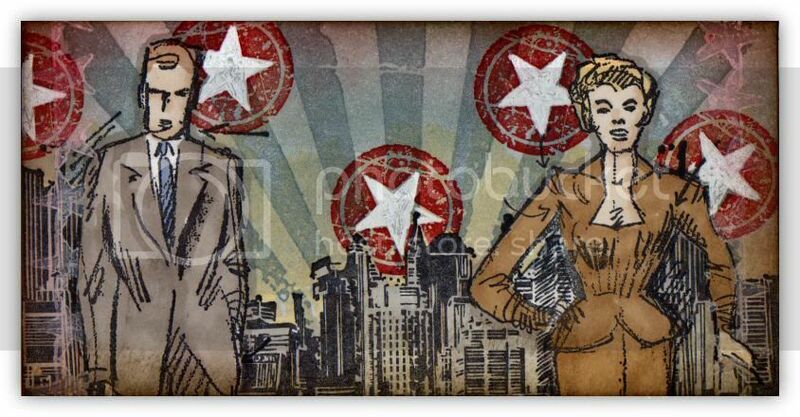 The background was created by stamping directly onto sticky back canvas and heat embossed to give a red work effect. The birds are paper pieced and raised on adhesive foam. 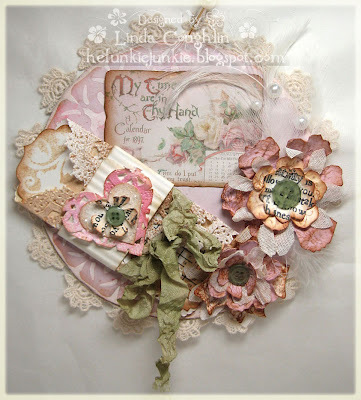 Kim has added a few flower's created using Tattered florals die with pearl centre's. Finished off with a bow from seam binding and a little vintage lace sprayed with sand glimmer mist. Like Lori ... I am not exactly sure which stamp is my most recent purchase ... but I knew my Studio 490 sets must be right up there ... and you know me ... that is all the excuse I need to use them! I altered this Ikea frame by covering it with Graphic 45 Botanicabella paper ... then darkened it a bit with a very watery coat of Claudine Hellmuth's Sable Brown paint. The stamp sets I used are Seriously Art; Live and Make Art; Alphabetically Art and Mail Art. I have made the flowers with Grungepaper and coloured them using Black Soot; Faded Jeans and Tumbled Glass Distress Ink. The hat and words are from Residential Art and coloured using a Pro Marker. The Design Team are looking forward to seeing your work! Drum Roll required here ... Because throughout December our wonderful site sponsor Simon Says Stamp is giving away a $25 gift voucher! The prize will go to a random entry chosen by Random Generator. The challenge will close at Midnight Eastern time on Sunday 9th January 2011 and the winner will be announced during the following week. To qualify all you need to do is create a new piece of work ... post it on your blog ... with a link to this site and then pop a link below so everyone can come see what you made! And who knows ... if you don't win this prize ... your work may be selected for the much sought after Top Three Blinkie.